Provides easy clean-up of cooking splatter as it protects the wall behind the cooking surface. 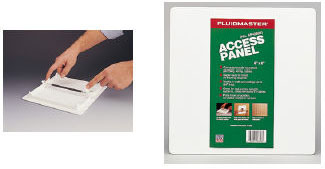 30" x 24" aluminum backsplash installs easily with four screws. Material thickness is only .019 - .023 so it lies nearly flush against the wall. Mounting screws are not included; four #8 screws needed for installation of each backsplash. High impact material can be painted or papered. Foam on back absorbs shock. 1/4" total thickness. Washable. White. Universal for right or left hand drain. Rust-proof. Holes 3" apart. OS: 11" W x 9-1/2" H x 2-5/8" D. Cutout: 9" W x 7-1/2" H x 2-1/2" D.
This outlet box includes a one-piece design that can be inverted for a top mount/center drain option. It installs with the following features: Quarter-Turn valves. 2-1/2" Sweat or 1/2" MIP x Male hose valves. EZ Out test caps. Raised drip guard. Made of 1/8" mirror acrylic, matches all bathrooms. Conceals damaged tile and walls. 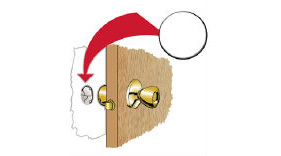 Easy installation, no special tools required. 14" x 6"